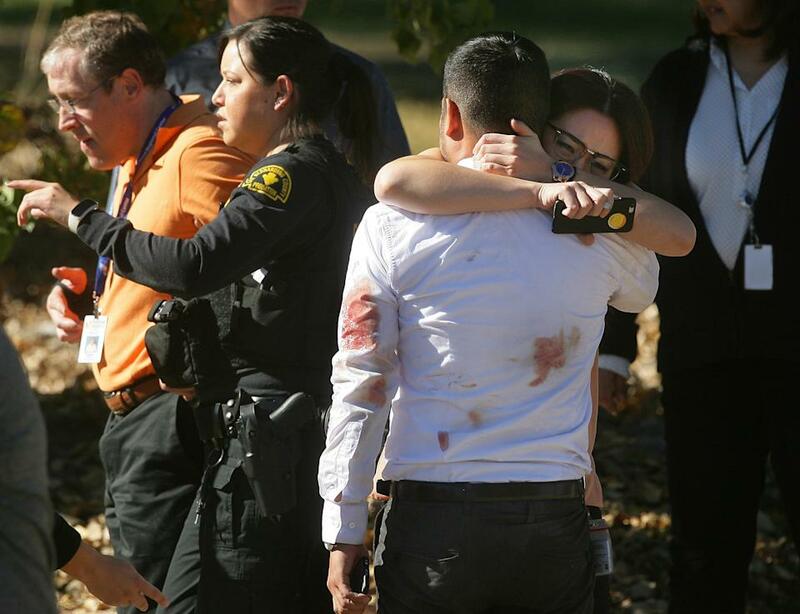 Police do not have a motive for the shootings, which ended with a gun battle on a San Bernardino street that left 28-year-old Syed Rizwan Farook and 27-year-old Tashfeen Malik dead. Authorities say they were the only two shooters, and relatives said the two were married. Investigators have not ruled out a link with terrorism and are also looking into the possibility that a workplace dispute triggered the massacre at a social services center for the disabled. Who are the suspects and how did they meet? Farook was born in Illinois and raised in Southern California, said Hussam Ayloush, executive director of the Council on American-Islamic Relations. His family is originally from Pakistan, Ayloush said. Farook traveled to Saudi Arabia earlier this year and returned with a wife, said co-worker Patrick Baccari, who attended the holiday party Wednesday but was in the bathroom when the shooting started. Baccari says Farook was gone for about a month in the spring, and when he returned word got around Farook had been married. The woman he described as a pharmacist joined him in the U.S. shortly afterward, and they soon had a baby. Police described Malik as Farook’s wife or fiancee. Baccari, who was sitting at the same table as Farook, said employees at the holiday party were taking a break before snapping group photos when Farook suddenly disappeared, leaving a jacket draped over his chair. Baccari stepped out to the bathroom when he heard explosions. Next After Coldplay’s Snub, Why Does Spotify Cling to Free Music?